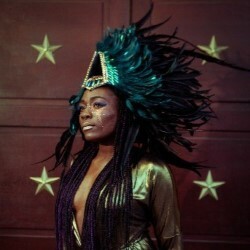 Rachael Young and her badass band of superhumans embrace Afrofuturism and the cult of Grace Jones in Nightclubbing; an explosive performance bringing visceral live music and intergalactic visions to start a revolution. 1981: Grace Jones releases her landmark album Nightclubbing; her body is brown and soft. 2015: Three women are refused entry into a London nightclub; their bodies are brown and soft. We are those women, zooming across galaxies, traveling through time, preparing for our moment to land... it's now! People of colour to the front, women to the front, LGBTQIA+ to the front! Warnings: Loud music. Flashing lights but not strobe. Haze.